We’re excited to announce that, for the 2nd year in a row, The ASCAP Foundation has generously donated 3 full scholarships (including travel expenses) to Mark Wood Rock Orchestra Camp this summer (July 12-19, 2015 in Olathe, KS). Last year, they sponsored 3 amazingly talented and deserving young singer/songwriters and composers. 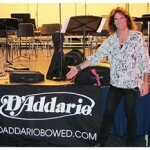 In addition, D’Addario Orchestral, a top-level supporter of The Mark Wood Electrify Your Music Foundation for 3 years in a row, is generously allocating part of their annual donation to sponsor one lucky camper this summer. D’Addario’s tremendous support of our Electrify Your Strings! program has taken many forms, including hundreds of thousands of dollars’ worth of strings and accessories to the many lucky schools who host our visits. We could not be more thrilled or more grateful for these wonderful gestures, and we will absolutely keep you guys posted about the lucky people who receive these scholarships. All scholarships will be awarded based on talent and financial need to music students aged 21 and under. If you or anyone you know would like to apply, please contact us and we’ll be happy to send you the application forms.